Nice and close to Union square. Very clean and well maintained. Has filtered water available on site so I don’t have to keep buying bottles . Good fitness center on site. On site bar and restaurant. Awesome and friendly staff . One of the best hotel experience in SFO. Parking was a nightmare. Parking attendant was no help. Had to call front desk attendant to get the parking attendant to park my car. Oh and by the way all of that costs me $58. The room was extremely small. The pictures make it look bigger then what it really is. Love this hotel. Love this hotel. Love this hotel. Love this hotel. Love this hotel. Wonderful experience. The staff was friendly and helpful from the moment we stepped into the hotel. The concierge was very friendly and helpful and remembered our names the next day. I tried to tip him when we left but he wouldn't take it. We will definitely go back there. Restaurant/bar had incredibly slow service. We had dinner there twice, breakfast once, and drinks once. Each time it was the same. 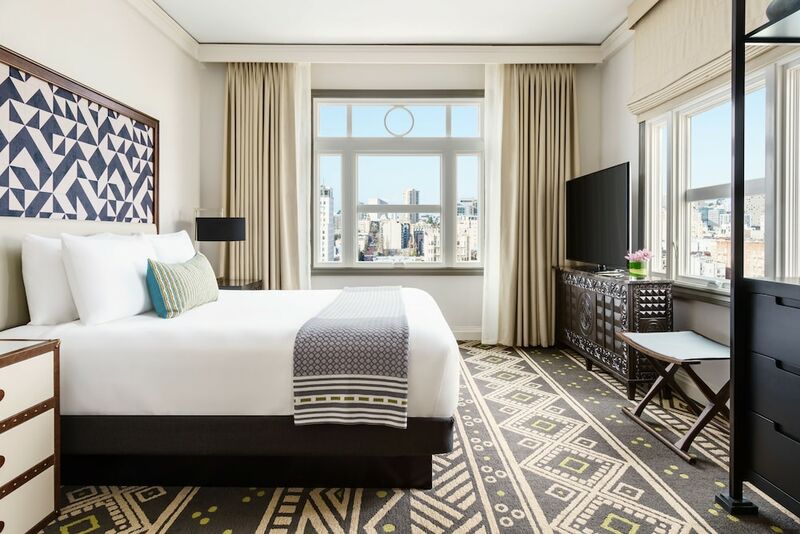 Located in Downtown San Francisco, Hotel Spero is a leisurely stroll from popular sights such as Powell and Market Cable Car Turnaround and Asian Art Museum of San Francisco. This 4-star hotel has 236 rooms and welcomes guests with a restaurant, a 24-hour fitness center, and free in-room WiFi. Sit down for a leisurely bite to eat at the onsite restaurant, or enjoy a drink at the bar/lounge. Start each morning with English breakfast, available for a fee from 6:30 AM to 10:30 AM. Guests can enjoy a flat-screen TV and stay connected with free WiFi. The bathroom offers hair dryers and free toiletries. Other standard amenities include a safe, a phone, and an ironing board. Hotel Spero features a 24-hour fitness center, free WiFi in public areas, and a 24-hour business center. Valet parking is USD 58 per day if you plan to drive, or hop aboard the shuttle from the hotel to the airport (available 24 hours) for USD 17 per person. Front-desk staff can answer questions 24/7, and assist with dry cleaning/laundry, securing valuables, and luggage storage. Additional amenities include coffee/tea in a common area, a banquet hall, and a hair salon. English breakfast is served daily from 6:30 AM to 10:30 AM for a fee. Jaspers Corner Tap - Restaurant and bar specializing in American cuisine. Open daily for breakfast, brunch, lunch, and dinner. Kid's menu available. Recreation features at Hotel Spero include a 24-hour fitness center. The front desk is open 24 hours a day. For convenient departures, you can take advantage of the airport drop-off service (fees apply). Driving? This property offers valet parking (fees apply).